I don’t trade a lot, but there were occasions in the past when I did want to make a trade, the work environment either prohibited me from trading right away or made it inconvenient to do so. In those cases, it would be nice if I could trade without relying on the internet at work and using personal device, aka smart phone, instead. I didn’t get a BlackBerry until last September, courtesy of my employer. Since then I have used it a couple of times to buy stocks from my Scottrade account. It isn’t really a mobile application. Rather, it’s a mobile version of the broker’s website that can be accessed from a smart phone, like a BlackBerry or an iPhone. The functions supported by the mobile website are rather simple, but it get the most important job done: Trading stocks on the go. In the past few months, I have noticed that many of my brokers started to offer mobile apps to make trading stocks easier. So how do they compare to each other? Research stocks and ETF with some simple tools such as charts and basic data. It also has a stock screener and a ETF screener, but it’s not very easy to use from my experience. 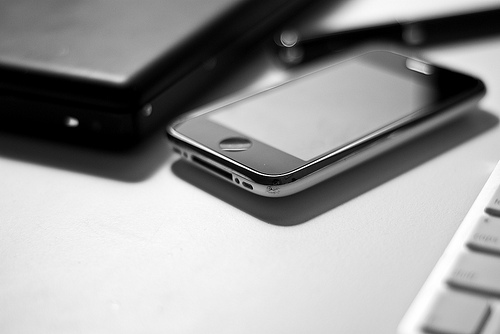 When I used Scottrade mobile to trade, I already knew what I want to buy, thus, there was so much need for using the mobile platform to do research or anything. As long as I can trade at any time, anywhere, I don’t have much to complain. 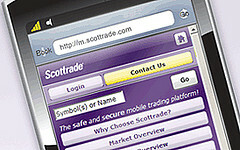 Additional information: Learn more about Scottrade and how to get 3 commission free trades. TradeKing is a new comer in mobile trading, only launched their mobile site early last month. Unlike Scottrade, to access your TradeKing account on your phone, you will have to go to enable mobile access from your account first, then create a different mobile PIN. Kind of a hassle, but TradeKing says this will add another layer of protection. From your account, you can also set preference of what you want to see on your phone (you can do that on your phone as well). When the preparation is done, you can now access your TradeKing account from your phone at m.tradeking.com. At this stage, TradeKing mobile doesn’t seem to have any tool for stock research, neither can it display stock charts. And the interface is even simpler than Scottrade’s. Additional information: Check out my TradeKing review more details about the broker. You can also get $20 bonus when opening a new account. OptionsHouse’s mobile trading platform, also a website at m.optionshouse.com, is as simple as the TradeKing’s. Functions offered by the two are pretty similar as well. If I compare OptionsHouse and TradeKing direct, then I think OptionsHouse comes out better. In addition to the functions, such as account balance, order status, and positions, that are supported by TradeKing, OptionsHouse mobile also lets users do limited stock research using smart phones. For example, when entering a stock symbol, OptionsHouse mobile shows the stock’s one-day chart, basic data (day high/low, 52-week high/low, volume, yield, P/E, etc), and 21-, 50-, and 200-day price moving average. As account information that’s also on the broker’s website, OptionsHouse mobile displays Daily, Monthly, and Yearly P/L on the phone as well. If OptionsHouse is your primary broker, checking account performance on the phone is easier on the phone with OptionsHouse mobile than with other mobile platforms mentioned above. In addition to your normal trading account, OptionsHouse mobile can also show your virtual account, if you have one. And you can trade both stocks and options using the mobile platform. Additional information: Find out more about OptionsHouse and how to get 100 commission free trades. Firstrade mobile is also quite new. The first difference from other brokers that I noticed when going to Firstrade mobile at m.firstrade.com is that I can see performance of all three major indices without even logging into my own account. Also, other information not directly related to personal data, such as market news, stock quotes and news, and movers on NYSE, Nasdaq, and Amex, are all available to everybody, even those don’t have an account with the broker. Once logged in, since you have already got quite a few functions for free, there aren’t much left to use, except that you can check your positions (break down into stocks and options), account balance, order status, and of course, make a trade. What I found not so convenient with Firstrade mobile is that if I click Trading, what I get is the order page without the quote. To get the quote, I need to use the Quote function first, then trade the stock either from there or go back to the Trading screen. 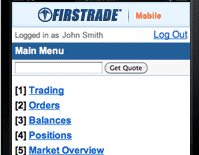 Other platforms, such as Scottrade, give the option to get the quote on the Trading screen. Not sure about you, but I like the latter better. Additional information: Firstrade is offering triple-bonus for new accounts. 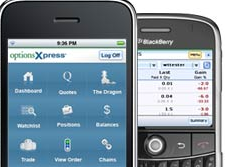 For all those mobile trading platforms I am using, optionsXpress probably has the best application that’s not a website, but a program that needs to be downloaded (at m.optionsxpress.com) and installed. The mobile app, called OX Mobile, not only looks very nice, but also supports many functions, much closer to what optionsXpress website offers than the above two do. Stock charts with different chart types and time intervals. With OX Mobile, you can trade stocks, options, and futures. I usually use Scottrade to trade stocks. But if I want to get more details about the stock, I always go to OX Mobile. Additional information: Now you can get $100 bonus for opening an optionsXpress account or 5 free trades for an IRA account. Overall, most of the mobile trading platforms I have tried are not that impressive because they are very simple in both interface and functionality, except optionsXpress. All of them offer basic functions such as checking balance, positions, and orders, making trades, and getting quotes. Some do have stock research tools, but they are all not at the same level as those you use on their websites, which is understandable given the limited processing power a phone has. I know it will be a while before broker’s mobile trading platform can function like the web-based trading platform, but making the mobile application more user friendly and useful (not just check balance and make a trade) should be easier to implement. Great post! I’m gonna try TradeKing!